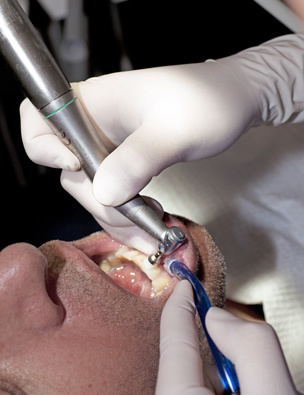 A standard oral hygiene procedure that removes plaque and calculus to prevent gum inflammation and disease. The removal of the roughened cementum and surface dentin that are impregnated with calculus, microorganisms and their toxins. We all hate that feeling - you bite into something cold, and your teeth practically scream in pain. If this happens to you frequently, you probably have sensitive teeth. Over time, gums recede, either through improper brushing or periodontal disease, and nerves become exposed. When those exposed nerves come into contact with cold food and beverages, they send that familiar jolt through your jaw. We may recommend special toothpastes and mouthwashes, but for more severe cases there are additional treatments available. Oral irrigation uses a jet-stream of anti-bacterial solution to clean 3-4 mm under the gum line, removing plaque and bacteria that brushing and floss can’t reach. Acid-producing bacteria collect around the teeth and gums in a sticky, clear film called ‘plaque’ which is responsible for tooth decay. Fluoride helps reduce plaque, prevent cavities and also repair teeth in the very early, microscopic stages of the disease. Tooth polishing smoothes the surface of teeth and makes it difficult for cavities to form.